Horns even series, and Big 12 record, with 10-2 victory over Wildcats. Zubia’s shot is sixth of seven hits in seven-run second inning. Henley pitches seven strong innings, allowing one run and six hits with seven strikeouts. The teams will play the series finale Sunday afternoon. Zach Zubia didn’t expect much when he hit a high fly to right-center field with two outs in the second inning Saturday. The Longhorn designated hitter would not have been surprised if the ball had been caught at the warning track. 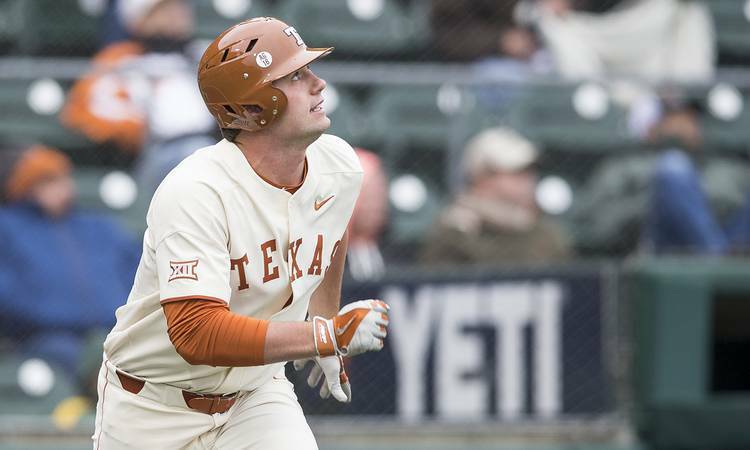 But instead of a Kansas State outfielder grabbing it, a stiff wind did, carrying it over the fence for a grand slam that gave the 14th-ranked Longhorns a 7-0 lead en route to a 10-2 victory at UFCU Disch-Falk Field. Blair Henley pitched seven strong innings as Texas (23-14) evened the series at one game apiece and its Big 12 record at 5-5. The Longhorns and Kansas State (15-21, 2-6) will finish the series at 1 p.m. Sunday. 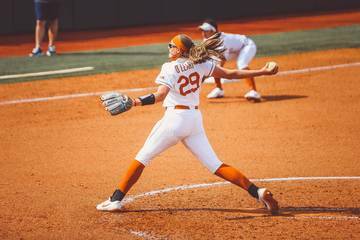 The Longhorns began the day ranked last in the Big 12 with 16 home runs — and low in other hitting stats as well — including just three homers in conference games. Then came Zubia. The right-handed hitting sophomore, batting .239 overall and .208 in Big 12 games before Saturday, launched a 3-2 pitch on a day when winds were estimated at 10-15 mph with gusts to around 30. Zubia’s shot was the sixth of seven hits for Texas in the seven-run inning. Masen Hibbeler, Ryan Reynolds, Michael McCann, Duke Ellis and Tate Shaw singled during the rally, and Sam Bertelson drove in the first run with a ground-rule double that bounced over the short fence in left. Bertelson, making his 18th appearance and seventh start this season, began the day batting .185 but elevated that mark to .226 after a two-hit game. Kasey Ford (0-3), Kansas State’s 6-foot-6, 285-pound starting pitcher — look, Tom Herman, another possible grad transfer for the offensive line! — left the game after that second inning, his ERA having increased from 11.74 to 13.32 (next to last in the Big 12). Ford was done, but not Zubia. He singled home Ellis — on another 3-2 pitch — to give Texas an 8-0 lead in the fourth. Zubia leads the Longhorns with four home runs this season. Austin Todd nearly matched him but settled for a triple when his line drive to right in the sixth hit high on the wall. Todd scored anyway, thanks to a sacrifice fly by Zubia, his sixth RBI of the game. Henley (6-1) did his part by allowing just one run and six hits. He struck out seven without walking anybody. Mindful of the weather conditions, Henley tried to keep the ball down. “Make sure they hit it on the ground,” he said. He induced eight groundouts and six pop-ups or flyouts in addition to the seven strikeouts.